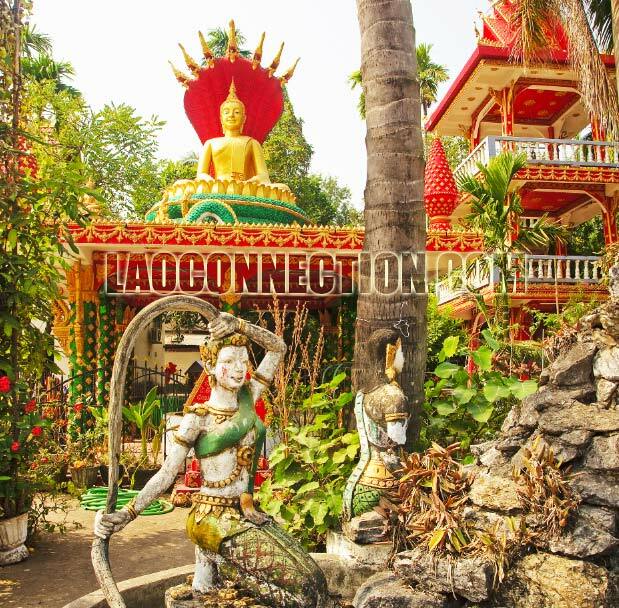 Can you identify all the things you see at a Lao temple? Many temples contain a variety of paintings, figures, statues, and objects from Buddhist stories and mythology - not to mention the different buildings, drums and decorative items. Some temples put more into their designs and artwork than others. Admittedly, much of this is dependent on how much money a temple has as well. Temples that are well funded by patrons and lay-followers, can be seen to have beautiful gardens, fountains, and ornate statues, like the one seen in the above picture. There are those who say that Buddhist temples all look the same. However, this is not the case and not all things are created equal. Taking the time to appreciate each temple and what it has to offer is a learning opportunity and a chance to explore Lao culture and art.